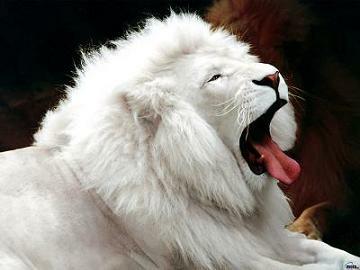 I was mesmerized the first time when I see a white lion in the zoo. I thought it was created by God differently to be the leader of the pack. Even though now that I knew that the cause was a type of pigment dysfunction, it doesn't change my love for such magnificent creature. Also known as achromia, is a group of inherited disorders that causes insufficient production of pigment (melanin) in the eyes, hair and skin. People with achromia have dysfunctional genes passed down from their parents. These genes weren’t able to provide the right instructions for the body to make the normal amount of melanin. Melanin is a dark-brown pigment and the amount of it in your skin, hair and eyes determines their color - whether light or dark color. And this is why people with achromia are usually abnormally fair. According to The National Organization for Albinism and Hypopigmentation (NOAH), 1 in every 17,000 people in the United States has some type of achromia. Achromia can affect all races and many of the affected children were born to parents of normal hair and eye color. Signs and symptoms are not always apparent on the hair and skin as certain type of achromia show more on the eyes than the body. Regardless of the color of skin and hair, all forms of achromia cause vision impairments. When we think of achromia, we often consider how vulnerable their skin is against sunlight and the increased risk of getting skin cancer. The lack of melanin means reduced protection against ultraviolet rays. However, we often neglected the fact that achromia affects the eyes deeply too. 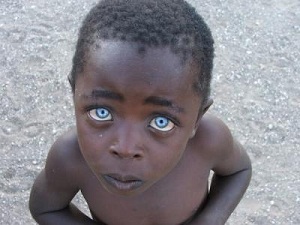 The eyes need melanin to develop normal vision. Melanin helps to facilitate the conversion of light energy to a nerve impulse that begins the visual process. For people with achromia, the conversion is seriously impaired due to the lack of pigment in their eyes. Lack of pigment in the eyes results in problems with eyesight, both related and unrelated to photosensitivity. The key problems of albinism with regards to the eye, is the retarded development of the macula and abnormal development of the nerves that connect the eye to the brain. No one know why the macula isn't developing properly but it is noted that melanin is needed for organizing the macula when the eye is developing. Moreover, it is also responsible for directing nerve impulses (contains data for image forming) from the retina to the image processing parts of the brain. The nerve impulses of people with achromia follow an unusual route to the brain which is probably the reason why the eyes aren't able to coordinate well together, causing strabismus. To have a better understanding of how people with albinism see, see the video below. Achromia is inherited. It happens when parents pass down one or more defective genes. These genes contain chemically coded instructions for making one of several proteins involved in the production of melanin. As they are defective, they are unable to send the right instructions to the cells which produce melanin (called melanocytes). This causes the body to be unable to produce the normal amounts of melanin. 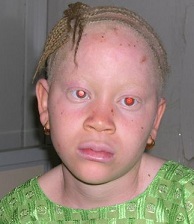 The most severe form is called oculocutaneous albinism (OCA). People with this type of achromia have white or pink hair, skin, and iris color, as well as vision problems. Another less severe form which only affects the eyes is called ocular albinism. The person's skin and hair colors usually appear normal. However, an eye exam will show that there is no coloring in the retina. Treatment for achromia involves relieving the symptoms of the disease and reducing risk of damage to the skin and eye. Visual aids can be helpful in correcting vision problems such as nearsightedness and astigmatism. Corrective lenses such as glasses, reading glasses, bifocals, bioptics and colored contact lenses can help individuals with albinism. To protect the eyes and skin from the sun, it is highly recommended to get the child completely covered up with sunscreen (with high sun protection factor) and clothing. Sunglasses that block both UVA and UVB can be useful in preventing sunlight from damaging the eye and alleviate light sensitivity. Eye muscle surgery is sometimes recommended by doctors to reduce involuntary eye movement (nystagmus) and realigning the eyes (strabismus). Do note that while such surgeries help to improve the cosmetic appearance, it doesn't improve vision much.